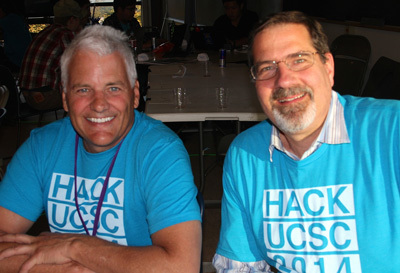 UCSC alumnus and Santa Cruz New Tech MeetUp founder Doug Erickson (left) and Brent Haddad of the UCSC Center for Entrepreneurship (right) at HACK UCSC 2014. 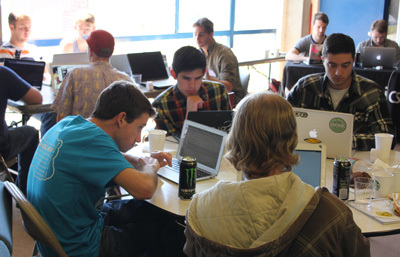 The first UC Santa Cruz hackathon was held at the Oakes Learning Center in April. "Our campus is 50 years young and providing ideas and energy to the regional economy," Haddad said. "We were very pleased with the inaugural event last year," said co-organizer Doug Erickson, a UCSC alumnus and founder of the Santa Cruz New Tech MeetUp. "When we surveyed the participants 2 weeks after the hackathon, we learned that over 50 percent had been made job offers." Co-organizer Mark Adams, program manager at Santa Cruz Works, was a senior in business management economics at UCSC and student coordinator at the Center for Entrepreneurship when he helped organize the April Hackathon. "It's events like the hackathon that contribute to a vibrant tech scene," Adams said. "Students discover that there is a local ecosystem that will support their efforts long past the hackathon." Technology sponsors including Plantronics, Driscoll's, Rackspace, Tessel, and others have contributed more than $80,000 in prizes and services for the hackathon. A complete list of sponsors is available on the HACK UCSC 2015 web site at hackucsc.com. Visit the web site to learn more, register, or to become a sponsor. Seats are limited.